Ford’s design team wanted to create a car that looked aggressive; it had to look like an RS. But they didn’t want to simply stick on a load of plastic bits that were all style and no substance. All of the design features you see on the RS, from wider intakes at the front to the rear spoiler and diffuser at the back, have a working purpose. The exclusive colour for this model is Nitrous Blue, and you haven’t really seen it until the sun is shining. There’s a lovely sparkle to it, and it is hardly surprising that it’s been the most popular choice. I also like the idea of Stealth; which could make you look twice to realise it’s an RS. The optional black, 19-inch forged alloys are a must, only increasing the aggressiveness of the styling. 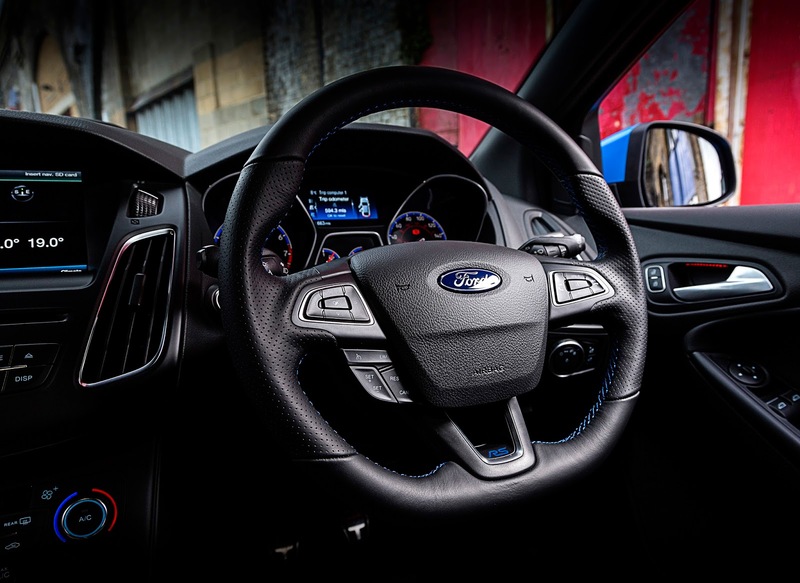 The interior uses the timeless recipe seen in generations of Fast Fords. The main attraction is the pair of body-hugging Recaro seats. The standard ones are similar to those in the ST. They offer plenty of lateral support as well as being comfortable and surprisingly easy to get in and out of. For an additional £1,145 you can choose the Recaro shell front seats. These not only look more streamline than the bulky standard seats, but give the RS yet more distinction from the ST. The chunky, flat-bottomed steering wheel has a small RS logo on it, and the boost gauges will look familiar to any ST driver. Overall the interior is very much similar to other Focus models, but from the driver’s seat there is a much sportier feel. The dials are bright and feature red needles and a blue glow, which compliments the stitching on the steering wheel and seats superbly. The engine in the Focus RS is a 2.3-litre, turbocharged petrol engine. It produces a healthy 350PS and, on overboost, 470Nm of torque. It is available with a 6-speed manual transmission only, and comes with a launch control feature; which is a first for me in a manual car. Once engaged you floor the throttle and the car holds 5,000rpm. Side-step the clutch and the car absolutely flies. There’s minimal wheelspin, and no bogging down of the AWD system. 0-62mph takes just 4.7 seconds. The top speed is 165mph. That’s some serious Top Trumps bragging rights there. The head-throwingly fast acceleration will surprise your passengers, and put an ear-to-ear grin on your face. There is a subtle induction note fed into the cabin via speakers, and a delightful exhaust note once you engage sport mode (which opens flaps in the exhaust). The RS pops and bangs, which is immature but exactly what a car like this should do. 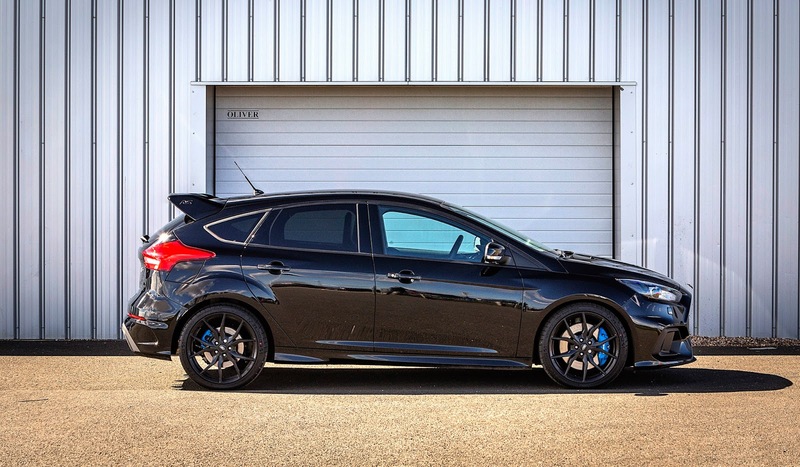 There are four drive modes for the Focus RS; Normal, Sport, Track and Drift. For each there are six key settings affected, and that means the drive modes actually change the handling characteristics. What’s key here is that when in sport mode, the adjustable dampers remain in ‘normal’ mode. That means you benefit from the sharpened throttle response and steering, without having a bone-shaking ride. You can change the dampers at any time via a button on the end of the indicator stalk should you wish. Stopping power comes from 350mm, four-piston Brembo front brakes. The AWD system with torque vectoring is incredibly clever. It can transfer up to 70% of torque to the rear axle and can then send 100% of that to either wheel. It can switch from left to right in 0.06 seconds, and manages to eliminate the AWD’s Achilles heel; understeer. Considering that this is a 2.3-litre, bonkers hot hatchback, the economy is rather good. Stick to normal mode and avoid the temptation to blast fellow motorists into tiny dots in the rear-view mirror, and you can get combined fuel consumption of 36.7mpg. CO2 emissions of 175g/km put the Focus RS in VED band H. That’s £300 first-year road tax, and £210 thereafter. The RS features start/stop technology too. I don’t think many RS owners would complain about fuel consumption; this isn’t exactly a car for those looking to save the earth. When all is said and done this is a Ford Focus. It has a reasonably-sized boot, albeit a little bit shallower thanks to the 4WD system that lies beneath. All passengers will have ample room, and unlike the Civic Type-R, the Focus is a 5-seater. There’s satellite navigation, rain sensing wipers, auto bi-xenon HID headlights, dual-zone climate control and Ford MyKey, which allows you to restrict the performance of the RS some what, to ensure that valets (or irresponsible friends and family) can’t get themselves into trouble. The Focus is like a people magnet, turning heads wherever it goes. The problem is that it can attract the wrong sort of attention too. And having one parked on the drive could make you feel at risk. uld drive, and drive, and drive in this car. And that sense of escape and freedom is the entire reason I fell in love with cars. The Focus RS is the living, fire-breathing embodiment of driving passion. And there you have it. The Focus RS might well have been one of the most anticipated cars of my time in motoring. And yet it has managed to better expectations and completely re-write our perception of a hot hatch. The Focus RS has also revolutionised the all-wheel drive system, eradicating understeer and allowing the driver to push harder. And this is car for anybody. Prices start at £31,250 and fully specced will be £36,535. This is a lot of bang for your buck, and if you want to find out more see your local Ford dealer or head over to the Ford website. This car is let down only by its own popularity; not all the attention could be positive, and you could be a little paranoid having it sat on the drive. But that aside, this car is perfection. It is the first in a new age of hot hatchbacks, and the rest of the world has some catching up to do.